1. If you put a class heading on your letter in GoogleDocs, go back and remove it. 2. Go to Tools > Word Count and double-check that you've written the minimum of 300 words in your letter. ​••••If you haven't hit the 300-word mark, get back to writing! 3. Print two physical copies of your letter. 6. ​Keep this document open. 7. Open a new browser window, and log in to your Turn-It-In.com account. ••••Click here if you cannot remember your ​Turn-It-In login credentials. ••••page 3 of your History Class Infographic. Click here to go to Turn-It-In.com. 9. Print​ the submission receipt that Turn-It-In gives you. ​••••If you already left Turn-It-In, you can print the copy of the receipt that they sent to your gmail account. 11. ... get your envelope with the real names pre-printed on the back. ••••Make sure that you still have your Tracking Chart open in a window on your computer..
13. Write a return address on the top left corner of your envelope front. ••••• See the example in the illustration below. ••••••••(a) ... your fake name. ••••••••(b) ... where you are mailing your letter FROM; i.e. where you are in this letter. ••••••••••••••••Not your hometown! Not your location in Letter #3! Where you are now. ••••••••(c) ... a made up street address. ••••••••••••••••examples: "18 Oak Ave.", "#6 Main St."; "121 Harvard Ave."
••••••••••••••••No numbers over three digits! Click here to view the "Dear America" partner names chart on Google. 14. Now that you've composed your return address, go back to your Info. Tracker, and complete Table 5. 15. 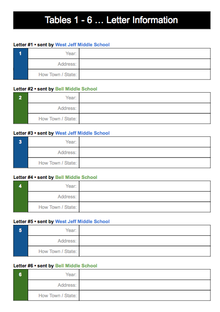 Write a mailing address in the center of your envelope front. ••••• The mailing address should match the info you wrote in Table 4 of the Info. Tracker. 18. Draw a color stamp on your envelope. •••••••... historically accurate; no ninjas, flying saucers, tater tots, blue llamas etc. ••••••••••Just do something simple like a U.S. flag, a nature scene, George Washington, a sailing ship, etc. 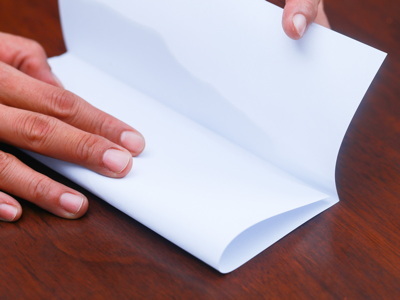 ••••If your letter is multiple pages, do NOT staple the pages that go in the envelope. 20. Fully seal the envelope along the entire gummed adhesive strip. 21. If your loose letter is more than one page, staple the pages together. 22. Give your your loose letter, and your sealed letter to Mr. Cushing. 23. Recycle your copy of your DA #5 Letter Outline. ​24. Log out of Turn-It-In, and GoogleDrive.